The study, published in the journal Human Movement Science, has come up with the best way to practice penalty kicks if a player favours waiting for the goalkeeper to move rather than just deciding on a spot before taking their penalty. Football players adopt two penalty-taking methods. One is deciding where to place the ball irrespective of the goalkeeper's actions, known as goalkeeper-independent. The second is to place the penalty to the other side of the goalkeeper's dive, or the goalkeeper-dependent strategy. In this second method, the penalty taker must anticipate and decide where to kick the ball at the same as running up and taking the penalty. However, research has shown that when the time available to make the decision is reduced, for instance because the goalkeeper starts moving late, this adversely affects a kicker's ability to accurately direct the ball to the side opposite to the goalkeepers dive. If a player waits for the goalkeeper to move before deciding where to place their penalty, they should use 'implicit' practice methods to improve their penalty-taking skills. Implicit learning methods encourage the player to develop their skills through independent decision-making, rather than explicit methods, which involve coaching-led development. This means that players should practice taking penalties by gradually increasing the difficulty of the penalty kick. For instance, by initially kicking from shorter distances and by using relatively large targets. Using this method, the amount of thinking required by the player during their run-up is reduced as their penalty taking skills are improved, therefore they can focus on the accuracy of their kick. Lead author of the study, Dr. Martina Navarro, a lecturer in Sport and Exercise Science at the University of Portsmouth, said: "A successful penalty kick requires that the penalty taker produces an accurate, well-controlled kicking action and at the same time watches the goalkeeper and makes a decision to which side to kick the ball. In other words, it is a defining feature of the goalkeeper-dependent strategy that a conscious decision is made while kicking. This makes the goalkeeper-dependent strategy essentially a dual task. "By practicing kicking skill and accuracy in an implicit manner will benefit penalty kick performance with a goalkeeper-dependent strategy compared to performance following an explicit intervention to improve kicking accuracy." 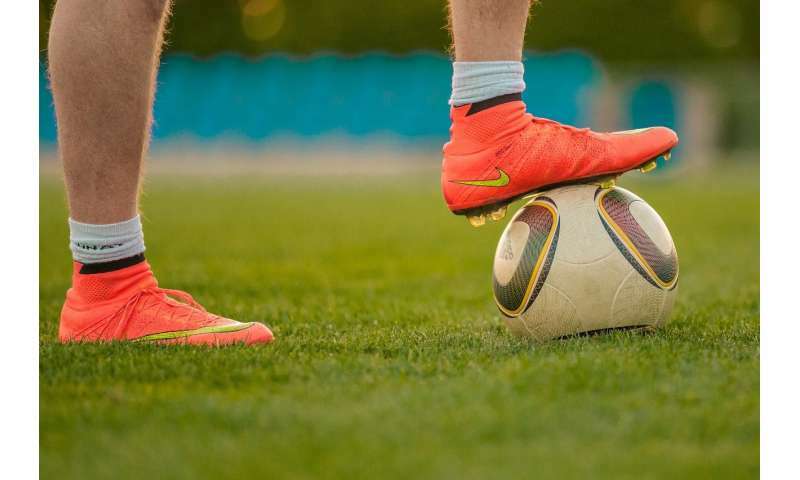 The study compared the effects of implicit and explicit training methods on the penalty taking performance of 20 football players from the youth academies of VU University Amsterdam in the Netherlands and Red Bull Brasil in San Paulo, Brazil. The players were divided in two groups and took part in a practice session to improve kicking accuracy (without a goalkeeper) and then in a post-test in order to examine the accuracy of their penalty kick performance (including a decision to kick to the side opposite the goalkeeper's dive). The results found that the implicit and explicit training method resulted in similar levels of decision-making, but after implicit training this was achieved with higher penalty accuracy. Dr. Navarro added: "When compared to explicit training, implicit training strategy results in higher kicking accuracy because it relies on an unconscious way of learning resulting in less cognitive demands while controlling the kick and therefore more attentional resources for deciding what side to kick." Don't tell the other team: Is this the ultimate guide to scoring and saving penalties?